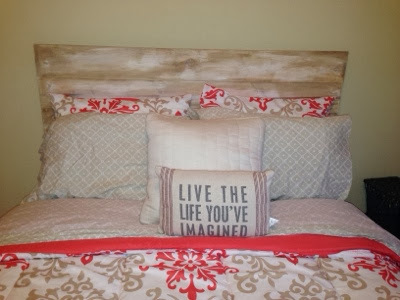 Instead of an upholstered headboard I decided to go with something a bit more rustic and instead of using pallets like I had originally planned I just used good ol' cheap whiteboard from the hardware store. Have you EVER tried to take a pallet apart? It's not an easy task at all! I bought 2-10' pieces an 8' piece of whiteboard and had the 8' cut in half for 2-4' posts then the other cut into 4-54" pieces for the horizontal slats.